"The Church says that the Earth is flat, but I know that it is round. For I have seen the shadow on the moon and I have more faith in the Shadow than in the Church." 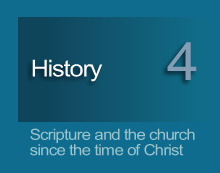 4.1 What is the Church of Rome's doctrine of infallibility? 4.2 How does infallibility relate to biblical interpretation? One thing he [Christ] said he would do was found a Church, and from both the Bible ... and other ancient works, we see that Christ established a Church with the rudiments of all we see in the Catholic Church today ... sacraments, teaching authority, and, as a consequence of the last, infallibility. Christ's Church, to do what he said it would do, had to have the note of infallibility. 4.3 The appeal to "spiral reasoning". The Church of Rome infers from historical observations, and its private biblical interpretations, that it alone has the note of infallibility. Using so-called spiral reasoning, it is then a simple matter to conclude that whatever an infallible church infers, its inference must be more than just that - it must be infallible fact. Furthermore, infallibility applies not only to the reigning Pope but, inasmuch as his pronouncements are perfectly reiterated by the church hierarchy, and in certain cases the laity, infallibility applies to them as well. Upon Catholicism's elementary doctrine of infallibility follows its belief that it alone holds the unique authority to direct whom will or will not receive God's forgiveness for sins. Although the complete argument is complicated by other uniquely Catholic beliefs such as the cooperation of Mary, this essentially translates into saying the earthly Church of Rome is highly influential in directing eternal destinies. Given the spiral argument for infallibility, there is no reason to explore further the basis for this or any other declarations by the Roman church. Yet there is one particular application of this belief in Rome's authority to direct personal destinies that contributed significantly to participation in the Crusades and Inquisitions. That application is the Church of Rome's unique doctrine of absolution. This concerns the second of three contributions that persons within the ancient Roman Catholic Church made that unknowingly helped foster the Dark Ages. These theological shortcomings are made extra disappointing by the fact that ancient Roman authorities had otherwise been so faithful for so long in preserving the ancient texts and major teachings of the Bible.